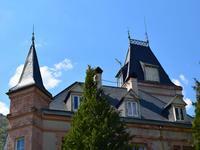 An ornate chateau in a small village close to shops, services and activities. Only 15 minutes to the motorway and train station, 25 minutes to Bagneres de Luchon, the “Queen of the Pyrenees” and the Val d’Aran in Spain. The owners have started to renovate this lovely original building including adding new insulation in the attic and a new roof. There are 10 bedrooms and 6 bath/shower rooms making it an ideal property for a bed and breakfast. The tower has 360 degree views and, once renovated would make a lovely room for relaxing, reading, working etc. •	Marble fireplaces in each room, each a different colour representing the various villages in the region. The roof has been replaced, insulation added to the attic and all windows are double glazed (with high quality acoustic, noise reduction double glazed units in rooms at the front of the chateau). The owner is currently renovating two bathrooms. Much of the renovation has been completed but there is still scope to put your own personal stamp on this beautiful building. You enter the grounds via a large wrought iron gate to the driveway and front garden with a large pond and fountain. At night, sensors detect movement and automatically turn on the electric lighting down the driveway. •	Patio doors at the end leading onto the terrace and down to the large private courtyard and garden. To the left are double doors opening into the lounge with a pure white St Beat marble fireplace and beautiful parquet flooring. 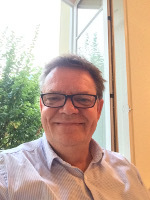 There is a large connecting door through to the grand dining room with the same carved cornice, parquet flooring plus half-timbered walls, patio doors leading out to the terrace and a lovely grey marble fireplace. 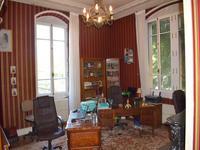 To the right of the hallway is the large office again with parquet flooring and marble fireplace. There is a fully equipped kitchen with tiled floor and fitted units. Beneath the staircase is a storage cupboard and next to this a door with steps down to the basement. A small room with wash basin leading into a WC independent with beautiful original marble and mosaic floor tiles completes the ground floor accommodation. •	Bedroom 1 has a green marble fireplace, 2 windows, wooden floor (covered by carpet) and a shower room (multi-function shower with music, Haman, massage jets and an integrated bath plus WC, wash basin set in a unit and tiled walls. •	Bedroom 3 does not have a fireplace. With a view of the famous Pic du Gar and bathroom with WC and wash basin. 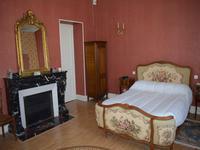 •	Bedroom 4 has a dark terracotta fireplace and a view of the Pic du Gar. This room has a bathroom that is currently being renovated by the owner. •	Bedroom 5 is featured in the virtual tour. 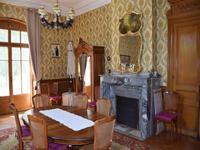 It is a large room with black marble fireplace and view of the Pic du Gar. It has a large bathroom with bath (with shower), WC, wash basin and bidet. This floor also has a WC independent with half tiled walls and original white and blue floor tiles. •	Holiday apartment to rent to guests. A large hallway has doors leading into each of the different rooms. •	Bedroom 10 is a double with a new shower room (shower with massage jets and integrated bath, WC and wash basin set in a unit. There is a dressing room that could be made into another bedroom if required. From the hallway, there are stairs up to the tower. This is split level with a staircase connecting the two rooms. The tower can be renovated and would be an ideal peaceful place to relax, perhaps a library, craft workshop, office. The second floor of the tower has 4 windows that give you a 360-degree view of the surrounding mountains and countryside. 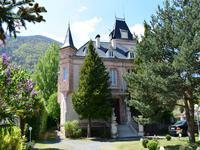 There is a large open basement in the Chateau that is used by the current owners as storage. 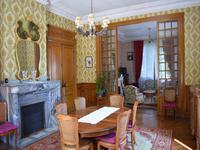 The rear of the Chateau has a large marble terrace, accessed via the hallway and dining room. Below the terrace is a laundry room and a garage. The marble staircase leads down from the Chateau to the courtyard/driveway with wrought iron gates into the large private, completed enclosed garden with barbecue and views of the mountain. A small gate from this area opens out into the side passageway. 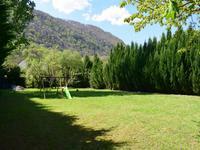 There is a natural source in the garden and it is a perfect place for a swimming pool. In the corner is a large covered store, ideal for garden equipment and furniture. Close to ski resorts, VTT routes, Tour de France climbs, a river cycling path, fishing and wonderful walks and hikes, this Chateau is in such a good location for anyone who wants to enjoy the mountains and the outdoors. In summary, this is a beautiful, classically shaped 10-bedroom chateau with massive potential, flexibility and scope either as a family home or to create a business.